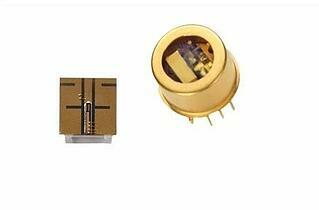 The common TO-8 transistor outline package measuring 0.55” in diameter by 0.39” tall and is equipped with TEC cooling with thermistor feedback. It also has a monitor diode and the window cap is epoxied in place for ease of repair in case it is damaged. This is an ideal package for research and academic use. Beam Characteristics: Free-space emission is typically 6⁰ on the slow axis (horizontal) and 28⁰ on the fast axis (vertical). These are FWHM measurements. Our wave-guide software generated beam size is defined differently than conventional methods. We estimate the near field beam waist through the far field divergence measurement. For example: the 6⁰X28⁰ divergence of a 795nm device has a waist size of 6.7um by 1.4um. The 852nm device at the 6⁰X28⁰ divergence has a waist size of 7.2um by 1.5um. Emission Position: Light exit area is located behind a 1mm thick BK7 glass window 0.039” from the top surface of the package. The aperture (exit area) size is approximately 1um by 5um. Slightly larger for our tapered ridge devices. Laser emission is within ± 0.5mm of center of window. Connection: The TO-8 package can be soldered directly to a PCB with proper heat sinking or may be use with our TO-8 Heat Sink Module providing sub D connectors for ease of use. 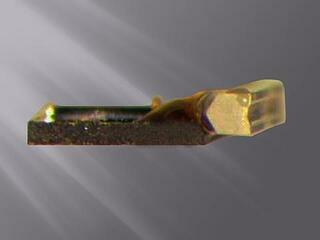 Case is electrically isolated from all internal components. 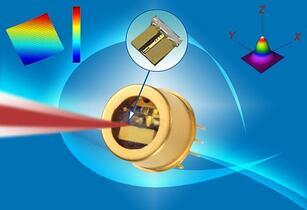 Assign optical power from those available. Use a three-digit format for all power entries. 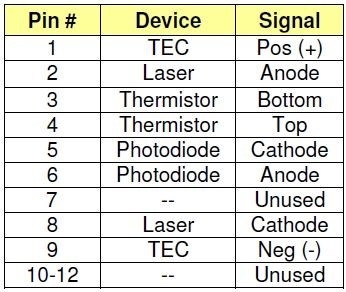 These devices are sensitive to ESD. 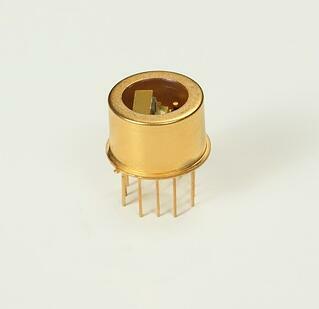 Photodigm has worked with leading researchers worldwide to deliver monolithic, single frequency laser diodes for the most demanding requirements. Our laser design and wafer fabrication engineers have consistently improved the performance of our devices. During this time, our users have seen higher powers, lower threshold currents, and higher slope efficiency compared to earlier generations of product. 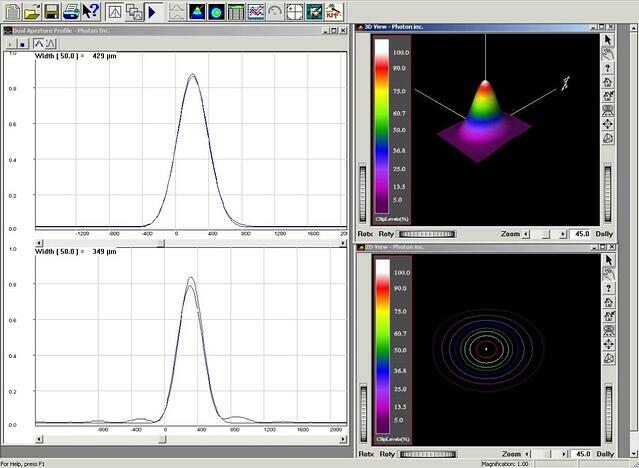 More recently, users have reported Gaussian linewidths as low as 500 kHz, comparing favorably with commercial ECDLs and almost an order of magnitude lower than competing DFB lasers. Coupled with our advanced packaging solutions, Photodigm lasers are setting the standards for spectroscopic laser diodes for research and industry. Fig. 1. The Photodigm TO-8 package. 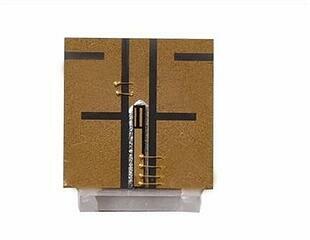 Right, TO-8 package with VPS lens. Fig.3 Free space beam profile measured after a single collimating lens with 8 mm focal length. The choice of an asphere is determined by the requirements of the user. The raw data and Gaussian curve fit exhibit 95% overlap. Available now in the TO-8 package. Photodigm continues to set the standard in precision semiconductor lasers with our PreciseMode™ product line. 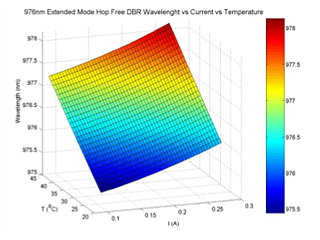 Addressing the two most vexing characteristics of laser diodes – mode hops and beam divergence – the Photodigm PreciseMode delivers a nearly circular, weakly divergent beam with a >2nm mode-hop-free tuning range. Both OEMs and researchers alike will find significantly improved user-friendliness with the same high performance specifications that they have come to expect from all Photodigm DBR lasers. Fig. 1. The Photodigm TO-8 packge, left view. Right, PreciseMode™TO-8 package. Photodigm Spectroscopy Certified™ single frequency, single mode DBR lasers are key components in high performance portable spectrometers. In the product pipeline are magnetometers, atomic clocks, fiber amplifiers, LIDAR spectrometers, and medical diagnostic instruments. In 2016 we introduced the PreciseMode DBR Laser to support these advanced product programs. This high speed (10 GHz modulation rate) package combines internal beam correction and 2 nm tuning range without a mode hop with deterministic mode selection over the life of the device. 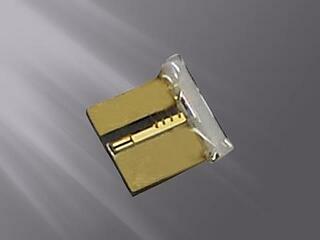 It is available at key wavelengths between 767 nm and 1083 nm and at power levels up to 240 mW. 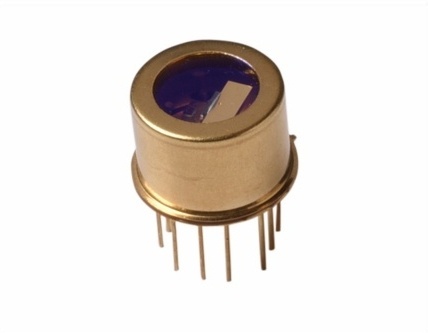 This gives the system designer access to the performance of a Ti:sapphire laser with the miniaturization and scalability of a semiconductor at performance levels that no other laser diode can match. Fig. 2. VPS microlens precisely aligned and mounted on an EMHF submount with Photodigm DBR laser. This product is available today in the TO-8 package.